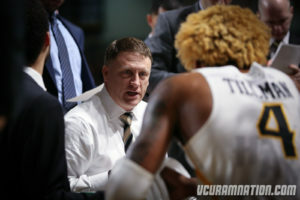 After getting a win in Amherst on Wednesday, VCU returned to the Siegel Center Saturday evening to host St. Bonaventure for the first time this season. It would be a tight battle that would see the Rams lose 68-63 to the Bonnies. Senior Justin Tillman Led all Rams in scoring with 20 points and also grabbed 10 rebounds. This makes 14 double-doubles on the season for the Detroit native. Only 1 other Ram hit the double digit mark in scoring on the night. Sophomore De’Riante Jenkins scored 10 points in the loss. The Rams shot 9-33 from behind the arc, almost double the amount that the Bonnies took, 18 and they hit 7 of them. Turnovers proved to be a factor in the loss. VCU turned the ball over 18 times, to St. Bonaventure’s 17 but that resulted in 25 points for the team from Olean, NY. The battle on the boards was almost an even match, 37-35, with the Bonnies winning that battle as well. The loss moves VCU to 16-13 (8-8) on the season. VCU will host George Mason on Wednesday, February 28th in the Rams final home game of the regular season.